When Elizabeth married Paul Chung jr. of Chicago, she thought she might pass the age of producing children too soon so she prayed to The Lord, "Lord I am getting old too soon. Please grant me twin sons." Later her husband learned what she did and said, "No. I don't want twin boys." So she prayed, "Lord, please forget the twin. Just one is good." But it was too late. The Lord had already granted the first prayer. So twin boys were born. On seeing the twin the father loved them so he named the first one Noah and the second Josiah. 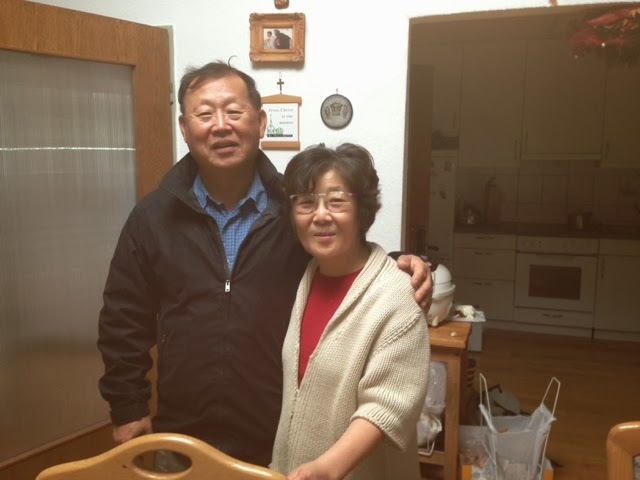 By the time I visited Pastor Abraham K. Lee's house her mom Oksoo Keller had just come back to Cologne after giving her daughter post-childbirth care in Chicago. And she is full of joy for the twin grandsons! 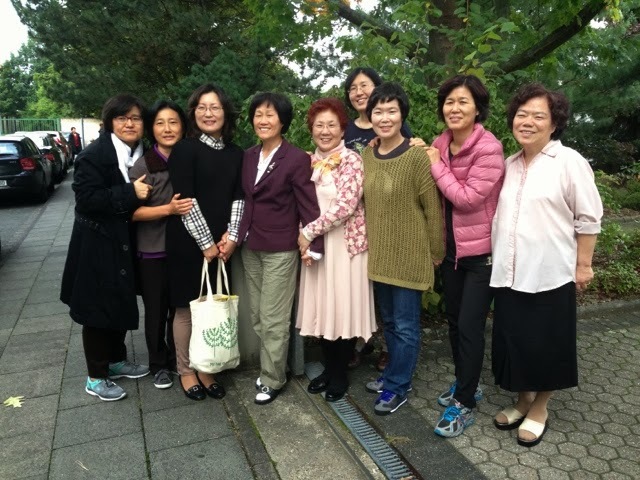 While she was in Korea Missionary Esther Lim (who is now in Los Angeles UBF) had 1:1 Bible studies with Shepherdess Yoon-sun Choi of Kyungsung UBF (3rd from left in the photo) who taught the Bible to Sister Maria Choi who has just been married to Yohannes Chang of Bonn UBF. On leaving Bonn Yoonsun Choi now a staff shepherdess in Seoul Kore asked me (Isaac Kim) to say thank you to Missionary Esther Lim. 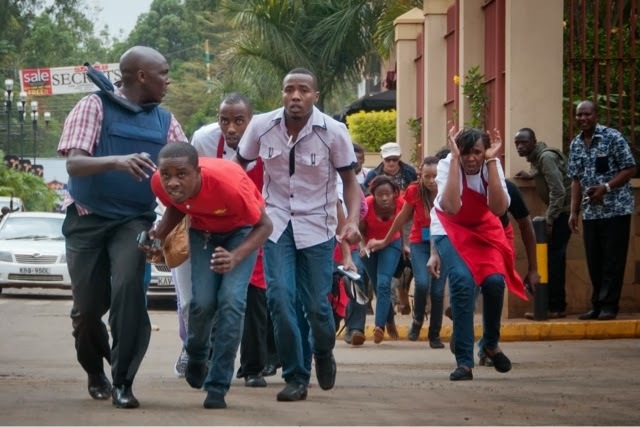 Last Saturday there was gun violence at one of the upscale shopping malls of Kenya Nairobi. The Kenyan government has reported 59 people dead and 175 injured so far. be the only and perpetual peace among the sinners. the power of the darkness in Kenya and all around the world." Missionary Mark Yoon writes, "It is assumed by now that this incident is organized by Al-Shaabab terrorists. (As you may know the Al-Shaabab is the branch organization of Al-Kaeda." Gunmen reportedly asked hostages if they could recite passages from the Quran and to name the prophet Mohamed's mother. Those who could not were either shot or continued to be held hostage. 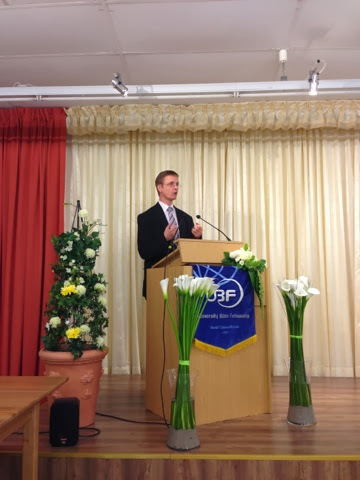 At 11:00 am August 22, 2013 at a worship hall located 10 minutes of walk from the Bonn UBF along with foreign delegates Bonn UBF members had an anniversary worship service. Pursuant to Dr Peter Chang's request Pastor Mark Vucekovich served a Sunday message based on Ezra 7:10. After the message Petrus Chang shared a testimony on Ezra's vision. He is 33 years old. 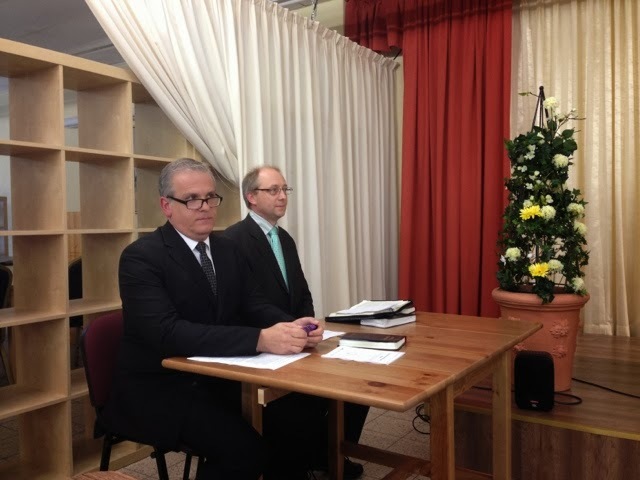 He has the vision for the students of Europe to read study and obey the Bible. Stephen Elsholtz shared Ezra's strategy to fulfill the vision (build bible living community; bible obeying community [mark 6:37]; bible teaching community). Shepherd Peter Schweitzer shared Ezra's prayer topics. 1. Bible study leading to spiritual awakening; 2. Release of intermarriage; 3.mobilization of spiritual leaders i.e. 500 bible teachers, 5000 prayer servants, 17,000 house churches. Then the Next Generation Leaders did a special song entitled "Take your candle go light the world." After a brass ensemble by Rebekka and Company, Daniel Yang of Chicago and Dr Peter Chang offered words of celebration. Holy Maria Ryu did a special song. Little Sarah shared a testimony on UBF Mission ministry. 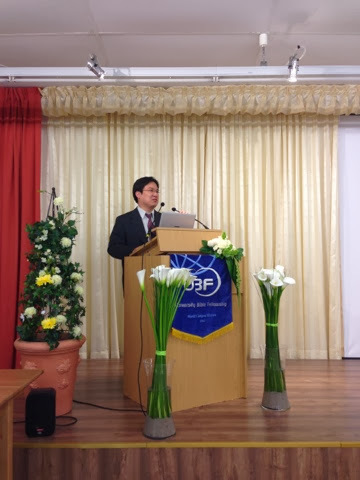 Isaac Kim from Los Angeles served a special speech entitled "Father's Love" based on John 14:23 "Anyone who loves me will obey my teaching my Father will love them, and we will come to them and make our home with them." He stated that we should remember the identity as a missionary sent by the Father to this world (Hebrew 11:9). The Father sent us here to invite the homeless to the home where God is the Father. To do so we need to love Jesus as the Apostle said "Fix your thoughts on Jesus". Then we naturally obey His teaching. In specifics we pray to build a Bible living Bible obeying and Bible teaching community. Thereafter there was a ballet dance and dinner fellowship. At 11:00 am of August 21, 2013 with Dr. John Jun officiating The Lord established a house church between Missionary Maria Choi from Chongno UBF II and Shepherd Johannes Chang the second son of Dr. Peter and Sarah Chang. On August 20 Friday upon arrival at the cologne airport i took a bus bound for Bonn. The bus dropped me at the Bonn main bus depot where missionary sarah chang picked me up. At the Bonn center they served a buffet lunch. According to Dr. peter chang he expects about 300 guests from different places (like CIS, Brazil, Korea, US. Ukraine) coming to celebrate the occasion (wedding followed by 33 years anniversary of Bonn ubf). Guests were still arriving. Around the eating table I had fellowship with people who were already there such as dr john jun, daniel yang, little sarah kim). Among those I heavily talked are the parents of the bride, a missionary to Moscow etc as listed below. - Shepherd peter and Youngk choi the parents of the bride maria choi to be married to johannes chang (29 MD internal medicine, cellist): peter's grandpa graduated from a divinity school in pyungyang North Korea. Before the Korean war his parents moved to Inchun s Korea. Peter is a high-school teacher teaching sports. Peter and his wife serve the Lord at chongno ubf II. Maria her first daughter responded to a missionary call at the 2009 European bible conference. In 2011 she went to London as a short term (6 months) missionary. Lately Holy (aka Happy) Maria spoke well of maria choi to dr Yohannes chang who in turn decided to marry her by faith. - Barnabas kim of Moscow: he is the shepherd of jaekun park who is a shepherd of joseph byung-sun kim of Pepperdine. He has 6 siblings. He is wonjoo kim. his parents were unbelieving. His hometown is Kum-San, choong nam. Once upon a time when the wife of his second elder brother visited a house of prayer a pastor looked at her and said "Buddhist monks are coming in and out of you. Go and pray for your salvation for 3 hours for 3 months." On further investigation she learned that unbeknownst to her upon her birth her parents had dedicated her to Buddah. Shocked by this discovery she started praying. At that time barnabas moved from his hometown to her house in seoul to attend a highschool. His sister-in-law then led him to a church in seoul. Soon after he entered korea university majoring in Chinese literature. Then he joined the Korean military where he met jae-Kun park. After military service he came back to school. Then he was invited to Anam ubf. In one of the conferences he met Jesus as his savior personally. 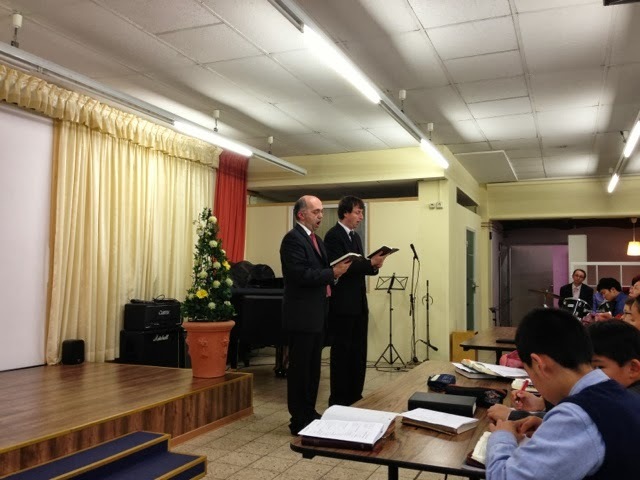 He led jae-kun park to bible study in Anam UBF. At 4:30 am the messengers meet at the center share daily bread pray together eat breakfast and then go to work. This lasted for the last three years. 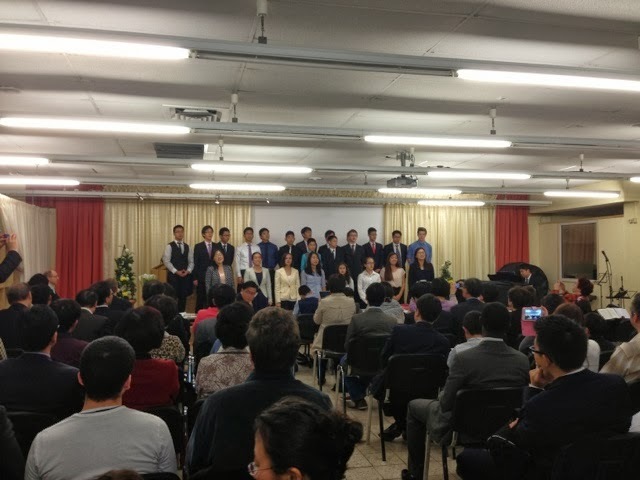 - john park (MBA) of new jersey: before during and after the 2013 ISBC along with his wife Grace he hosted and served 150 plus foreign delegates of which 39 were from CIS. Before inviting second gens last summer he made an elaborate plan of eduction (common life, daily bread training, summer class, sports fellowship, visitation program for history education etc) contacted parents and motivated them to register. With the vision of the bible New Jersey and world campus mission among the second gens he is now building a youth training center consisting of 35 units of 2 beds in front of the ruckus university with the construction cost of about $6 mil. Completion is due in 2014 January. During afternoon hours I took a nap at the apartment of Peter Schweitzer. Then at the Bonn UBF center they served dinner (Korean Bibbab). Thereafter I had a long talk with Dr John Jun Dr peter Kim of Kiev John Park etc. Close to midnight Dr John Jun fell asleep on his seat so I called the meeting to rest, prayed and finished the meeting. On the way back to Peter's apt I looked up to the sky saw full moon took a pic of Bonn night sky. 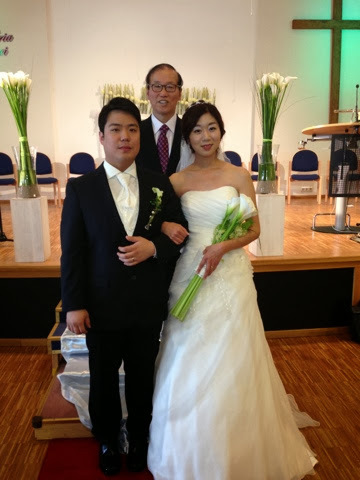 On sep 21 2013 Dr peter chang of Germany is scheduled to see his youngest son getting married in Bonn Germany. The couple (yohannes chang and Maria choi) sent me an invitation letter. At first i was unwilling to attend. But his father personally invited me with words that are earnest and inviting. So far in ubf worldwide many second gens are getting married so i kept receiving invitation cards but it is the first time that i did get invited by a father! Dr peter's move then reminded me of Matthew 22 where the Heavenly Father sends out invitation to all for his son's wedding. So i changed my mind and chose to attend. The flight was strenuous. On sept 19 At 3:50 am david park came to my house and gave me a ride to lax. The airfare was the cheapest one with two stopovers - one at Miami another in berlin. In miami the connection was tight. Plus there was a long walk from terminal d to terminal f. I almost missed the connecting flight but thank god it was delayed for 20 minutes. During the flight (air Berlin) night fell and i had a terrible nightmare. In a dream i was away from my hometown. Feeling terribly homesick i chose to go back home. I caught a train bound for home. Train was crowded, seat was hard and uncomfortable. Somehow i curled up at a corner, had some sleep and arrived at the hometown. The house is a small country hut but it was in ruins. No one (no mother no father no siblings) came out to greet, which I had already known. It was late at night. The area was poorly lit yet i managed to get into the room in the backside where i used to stay. Then II started to unpack. Then i was awakened: the realization hit me! I forgot the fact that this hometown house had already been foreclosed! Then i woke up and it was a dream! I don't know how long the dream lasted - maybe 40 some minutes? I relived the traumatic experience of 40 plus years ago losing my home during collage days. Since my eldest brother who was in charge of family finance at ok san went insolvent creditors came took everything and all family members were rendered homeless. Now in a not so young body i am up in the air (perhaps the flight ab7211 crossing the pacific or Atlantic Ocean) heading for Germany away from home. For Christians home is first a spiritual place then physical. So they say you can buy house with money but not home. How do you get this home? In john 14 Jesus answers the question:  Jesus replied, “Anyone who loves me will obey my teaching. My Father will love them, and we will come to them and make our home with them. Two parts: our part and the Father's part. Our part consists of two components: love Jesus and obey his teaching. God sent Jesus to this world to find the homeless back to be at home with Him. In 1971 The Lord sent one of my law school classmates who invited me to bible studies in ubf where i met jesus as my lord and savior. Now the airplane landed at Berlin. In an hour i need to catch another flight going to cologne. There i need to find the way to Bonn ubf. If i go there perhaps before noon i can meet some friends in Bonn. I was told the German shepherd peter Schweitzer invited me and pastor mark vucekovich to stay at his 'home'. Tomorrow a young couple will come to build a home. So my prayer goes for them to be united in Jesus the maker of home truly sweet home. The airplane is now at the gate and i need to stop, get out and catch the connecting flight. 22 Ways Christians Think Differently on Life - Why Work? In a capitalist nation one works for material benefits such as paycheck. When he does not get paid, he does not work. The more he is paid, the more he is motivated to work at least to a certain extent. In reading the four gospels we see Jesus calling his disciples to work as unworthy servants. As such they are to work, work, and work, until they are all worn out, and they are called to do so even when there is no immediate benefit of work. After "working" them out for more or less three years, Jesus left them for "heaven" without providing them with paychecks. During the tenure of their "employment" Jesus never paid them a dime. In leaving his children behind Jesus did not provide them with any retirement programs such as pension plan. After Jesus' departure did the "apostles" stop working? No, for it is said only John died a natural death. All the rest went to one 'mission' field or another, and suffered martyrdom. In the Last Judgment, for example, Michelangelo depicts Bartholomew displaying his flayed skin suggesting people Bartholomew chose to serve treated him just like a Japanese Sushi Man doing sashimi out of the catch of the day. Why did they work ever so sacrificially? So far Abraham worked in expectation of the payment that is the son to come out of his beloved wife Sarah. It appears that he did not know that being a father to a son comes with an entirely new batch of "work". In a movie entitled "Dad's home", a man's wife died after producing two kids. 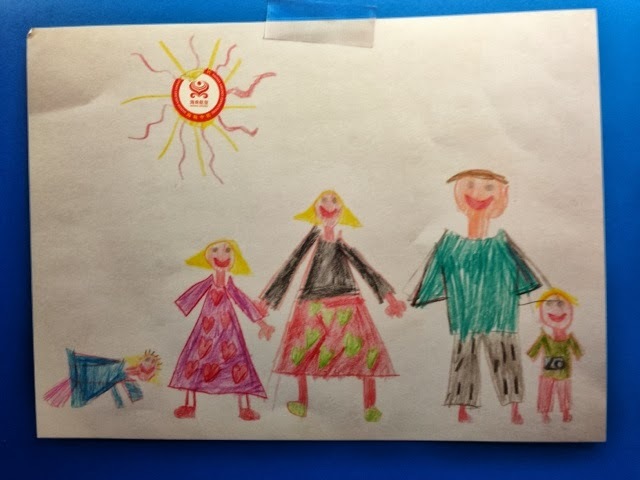 Then he lost his job and had to work at home endlessly not for a new job, but for kids (fixing meals for the kids, giving them a ride back and forth for schooling, doing laundries, and the list goes on and on). God knew better than Abraham that son is not the reward but represents more work for Abraham. Why then does God call his children to work? We already know the answer: he truly wants to reward their children, with true reward, that is, God himself. He himself is the payment. And by him "calling" (or hiring if you will) you to work at his company where He is the boss (or the payor), you have already been paid off with a blank check (in the line for the order party you can write 'cash' so you can always cash it in) for all the work you are called to do. And as you work more for Him you come to know him better. 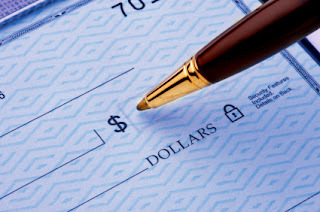 In this way as you work more your reward is going to be credited to your account to an infinite degree. "I am your very great reward..."
Compare this statement with what Abraham said, "What can you give me since I am childless..." Here 'What can you give me" is as good as saying, "You haven't given me a penny yet." Infinitely great benefit vs. a total emptiness. Abraham is like a man who has been given a checkbook with the right to write a check (in an amount which is not limited) out of the savings account where the balance never runs out! Yet he said, "What can you give me?" Caveat: you may not be able to see this as practical, for if anything is too big you end up not being able to see it. Not all that are physically visible are all there is. In fact what you can sense with your five senses represents only a fragment of reality. So you are a student, an employee, a pastor, a husband, a father or a mother. Why do you work then? In 2 Samuel 5:24 it is written: "[You are to] move quickly as soon as you hear the sound of marching in the tops of the poplar trees..."
Most likely the sound of [the Lord] marching was not different than the sound of trees moving at the blowing of winds. When wind blows on a tree, it starts moving swaying back and forth beginning at the top. Imagine you in the shoes of David positioned next to a poplar tree. If you knew how to hear the Lord, you could recognize the tree tops moving as the sound of the Lord marching. Otherwise you would not know the difference, so you would not go for the victory. Question: how did David inquire of the Lord? How did the answer come to him? In view of the practices of the kings in the day of David, the means used include dreams Urim or prophets. 1 Samuel 28:6 How then was he able to hear the instruction involving the sound of the Lord's march? We find the answer to the question in Exodus 25:22, "There above the cover between the two cherubim...I will meet with you and give you all my commands for the Israelites." For those who believe in Jesus the Lord sets up the ark inside of the believer's heart. So the RTS (real time synchronization) in the area of the department of communication takes place "within" you. In case of David (a believer) most likely he must have gotten the message (the strategy to go around and attack on hearing the sound of the Lord marching) in his inner sanctum built inside, and he must have gotten it in a dream at night. But why is it that some are able to hear the Lord some don't? Again we find the answer in Exodus 25:22. Consider the ark (communication system if you will) as a radio with different channels. To listen to a radio program you adjust antenna (if there is any), you tune in to the right channel and you hear the sound. When you are off you don't. Why is someone off someone on in one's communication line with the Lord? Study of the ark the Lord commanded Moses to build, and you will find why, noting that the Lord asked Moses to make the ark to get into a relationship with his children. Even between husband and wife when the relationship goes sour the two cannot communicate. So the question of 'how' and 'why' goes to the issue of one's relationship with the Lord. Why does a relationship go sour? Begin with the Moses' Ten Commandments, for these are not just a set of do's and don'ts for nothing: The Lord gave the Israelites to build a working relationship with them. The ark (containing the Ten Commandments placed underneath the atonement cover kept by two cherubim) put in the Holy of holies is the foreshadow of the realty to come, that is, our Lord Jesus Christ, the High Priest, the Prophet, and the King. When one repents turns to the Lord by faith in the Lord, one gets into the relationship with the Lord, so he can talk to, walk with, and live with Him daily. Look at verse 1a. "During the reign of David, there was a famine for three successive years so David sought the face of the LORD.” The people of Israel relied heavily on rainfall for their survival in the land. They had two rainy seasons: spring rain and fall rain. If it does not rain the grass cannot grow, and animals such as cows, horses, sheep, and goats cannot graze. Of course the produce prices will go up for vegetables, such as cabbage, lettuce, and fruit crops, like tomatoes, watermelons, cucumbers, and pumpkins are going to be ruined. The land of Israel was the so-called Promised Land. Before sending the Israelites into the Land, the Lord emphasized to the Israelites that the Promised Land was going to flow with milk and honey, which means that the Lord would bless the land in such a way that the Israelites would enjoy an abundance of food. But strangely during the reign of David, the exact opposite was taking place, that is, three years of continued famine. At first, people might have thought that the drought must have been a temporary phenomenon. But it was not the case. They waited and waited, but it did not rain. And the drought continued for three years. Finally, King David came to his senses. It was not an accident. The drought came from the Lord. What did David do when he was at the end of his rope? Look at verse 1b. "he sought the face of the Lord." King David got the message. So he summoned the Gibeonites and spoke to them. Look at what verse 2 says in parenthesis: “(Now the Gibeonites were not a part of Israel but were survivors of the Amorites; the Israelites had sworn to [spare] them, but Saul in his zeal for Israel and Judah had tried to annihilate them).” We find the background of this remark in Joshua 9. A close review of chapter 9 indicates that the Gibeonites were very much like Rahab of Jericho. Like Rahab they too heard the name of the God of Israel. On hearing the great work the God of Israel did, the fear of God Almighty arose in them. They humbly accepted the reality that they deserved to die. Most likely they discussed among themselves what to do. Like other Canaanites then they could have resolved to take the matters in their hands and stand up against the army of the Lord. But on further analysis they realized that it was not going to work. So they had to find another alternative. In the case of Rahab, the opportunity knocked on the door and she took advantage of it. But the Gibeonites did not have such an opportunity. However, they did not give up. They finally figured out a plan: they decided to resort to a ruse. Thus instead of waiting for the door to open they responded to the reality “proactively.” Look at Joshua 9:9-11. "They answered: ‘Your servants have come from a very distant country because of the fame of the LORD your God. For we have heard reports of him: all that he did in Egypt, and all that he did to the two kings of the Amorites east of the Jordan--Sihon king of Heshbon, and Og king of Bashan, who reigned in Ashtaroth.Joshua and our elders and all those living in our country said to us, “Take provisions for your journey; go and meet them and say to them, ‘We are your servants; make a treaty with us.” ’ ” They resorted to a ruse to make a treaty with the Israelites. They lived nearby, yet they pretended that they came from a distant country. To convince Joshua they even showed the moldy bread, cracked wineskin, clothes and sandals which were all worn out. Joshua sampled the provisions, and ended up believing. Thus they got into a treaty. The Israelites ratified it by oath, meaning they sealed the treaty in the name of the Lord. Just as the two spies entered into a irrevocable covenant with Rahab in the name of the Lord, so also the Gibeonites secured an irrevocable agreement from the hands of the people of the Lord. Joshua 9:15 describes the transaction as the "treaty of peace". Joshua soon discovered the truth, but it was too late. So in consultation with the elders Joshua added one condition to the treaty, that is, subjecting the Gibeonites to serve the Lord as woodcutters and water carriers at the Lord's temple wherever it may be located (Jos 9:22). On hearing the condition, the Gibeonites gratefully accepted it saying, "We are now in your hands; do to us whatever seems good and right to you" (Jos 9:24). Legally then the Gibeonites became servants of the Lord serving the priests at the Lord's temple. Their duties as woodcutters and water carriers were primarily menial. But since it was the work of the Lord that they were called to take care of, they came to live a life that is truly blessed. In Psalm 84:10, King David sang of the blessed life at the Lord's temple saying, "Better is one day in your courts than a thousand elsewhere; I would rather be a doorkeeper in the house of my God than dwell in the tents of the wicked." The Gibeonites used to live among the wicked. They themselves were wicked. The land and people they lived with were wicked, deserving God’s judgment. But by God's grace, they came to take possession of the blessing – the blessed mission to serve the Lord in the house of God. But what did Saul do to them? “It is on account of Saul and his blood stained house.” In what sense was his house "blood-stained"? It is because he put the Gibeonites to death (1c). When did he put them to death? Verse 2b answers the question: "(Now the Gibeonites were not a part of Israel but were survivors of the Amorites; the Israelites had sworn to [spare] them, but Saul in his zeal for Israel and Judah had tried to annihilate them).” This passage, especially the expression, "in his zeal for Israel and Judah," sounds confusing, but it shows exactly why we say Saul is a typical "humanist". It tells us exactly why a man like Saul represents an object of God's abomination. You know, like everyone of us, God also has a personality. Like all of us he has feelings, likes and dislikes. On many occasions we get upset. Likewise the Lord God also gets upset. And what Saul did caused the Lord to be so upset that the Lord's anger did not subside even after Saul committed suicide. In what respect then was Saul's act so abominable? Why was it a stench to God's nostrils? We can get a better understanding of the horror of Saul's act when we examine 1 Samuel 22:6-23. Here verse 19 reads, "He also put to the sword Nob, the town of the priests, with its men and women, its children and infants, and its cattle, donkeys and sheep." Nob is located at to the northeast of Jerusalem. It is a satellite city of Jerusalem just like Florence is next to the city of Downey. In view of Joshua 9:22 and 26-27, it is not unlikely that it was while the Gibeonites were at Nob at the time of Saul's massacre that a significant number of people came to be murdered. Let us take a few steps back and take a look at what Saul did. The Scripture says that Saul did this in his zeal for Israel and Judah. Apparently, he tried to annihilate the Gibeonites for they were aliens. But his action is not justified for he trampled upon the name of the Lord, according to whose name Joshua entered into a treaty of “peace” with them. His action here is in contrast with his inaction in 1 Samuel 15:3-9. Let us read this passage responsively. In his passage he did not do what the Lord specifically asked him to do. Yet he disobeyed the Lord for he was tempted by the goodies of the booties. But in the case of the Gibeonites he did what the Lord would never, never, never allow anyone to do, that is, break his promise and render himself to “unfaithful” to his words. In addition, because of God's merciful and faithful character he would never trample upon the rights of the poor or powerless. And the Gibeonites were the poorest of the poor. Yet, in the name of promoting the interests of Israel and Judah, Saul tried to annihilate the Gibeonites. What is truly embarrassing is that even though Saul did what the Lord truly hated, Saul himself thought that he did something truly laudable. This was Saul’s problem. It shows how wrapped up in himself he was. He was spiritually blind, as blind as a puppy dog. In vs. 3-14 we see that it was only after King David removed the seven male descendants of Saul that the Lord allowed the rain to fall again. One thing that strikes us is David's obedience. Upon learning what the Gibeonites wanted, David could have said that their requests were dishonoring the late king Saul. But strangely he quickly allowed their request, that is, he caught all the male descendants of Saul except Mephibosheth, and handed them over to the Gibeonites. What did they do with the descendants of Saul? Look at v. 9. "He handed them over to the Gibeonites, who killed and exposed them on a hill before the LORD. All seven of them fell together; they were put to death during the first days of the harvest, just as the barley harvest was beginning." What King David did may seem confusing, for in regard to Saul, he refused to touch the king, for Saul was a servant anointed by God. But in the case of his male descendants, he quickly got them arrested and handed them over to the Gibeonites. He did this all in obedience to God's will. God blessed his obedience by sending rain (10). Verses 10-14 give us a snapshot of how the people of the land received healing from the sins committed by Saul. Look at verse 10. "Rizpah daughter of Aiah took sackcloth and spread it out for herself on a rock. From the beginning of the harvest till the rain poured down from the heavens on the bodies, she did not let the birds of the air touch them by day or the wild animals by night." According to one Jewish authority Rizpah, one of Saul's concubines, protected the bodies of two victims (her sons) from the springtime harvest till the fall rainfall. Although the Lord prohibited leaving a corpse unburied for even one night (as in Deuteronomy 21:23), God decreed that the bodies be left there for a lengthy time so that all would see that he condemns those who take advantage of the poor and powerless, such as the Gibeonites. A comparison between verse 10 (where we see the rainfall) with what David did in verses 11-14 shows why David chose the time to give Saul's body proper burial (1Sa 31:8-13). The rainfall after three years of consecutive famine proved that Israel's sin had been atoned for. The Lord relented his anger against Saul. The Lord began to heal the land. "David sought the face of the LORD. The LORD said, ‘It is on account of Saul and his blood-stained house; it is because he put the Gibeonites to death.’ "
The Bible says, "Nothing in all creation is hidden from God's sight. Everything is uncovered and laid bare before the eyes of him to whom we must give account" (Hebrews 4:13). So far we have seen the account of Saul and what his actions or inactions amounted to. The author of 2 Samuel gives us the account of other people such as David, Jonathan, or David's generals like Joab. The time of our life represents the opportunity for us to prove ourselves in the Lord. Therefore we must give account, for everything we do or don't do comes with consequence. In our ministry several of us majored in accounting and work in the accounting industry. Any students majoring in accounting understand what financial statements (the Balance Sheet, Profit and Loss Statement, and Cash-flow Statement) come down to: how much did you gain or lose? At the end of each term, in order to check how you did, your CPA collects all the records, check sall you have (like current assets, receivables, inventory, fixed assets, current liabilities, stocks, investments, goodwill, etc. ), works all the numbers, and reduces them down to a conclusion: how much you are worth (financially). Primarily, 1 and 2 Samuel contain the account of two persons: the account of Saul and the account of David. In fact, 1 Samuel ends with Saul committing suicide, whereas 2 Samuel closes with the final reflections on David's reigns (21-24). Tonight we took a quick look at 2 Samuel 21, with the title, "The Account of Saul" [rather than of David], for interestingly it was David who uncovered some "missing" numbers of Saul's reign, reflected them into Saul's balance sheet, and then the Lord closed the file. And one word that comes out in reviewing Saul's account is this: Saul fell victim to his humanistic ideals. Describe one important characteristic of an agreement (such as treaty) entered into by two parties “on oath” (in the day of Samuel)? The City of Nob (of the day of Saul and David) was inhabited primarily by [ ]. 4. Describe three critical mistakes (or sins) Saul made as a king. 22 Ways Christians Think Differently on Life - the 12 factors, none of which you can miss. On January 28, 1986, the world watched the Space Shuttle Challenger breaking up in the mid air, resulting in the deaths of the seven astronauts. The cause? O-ring failure. I do not know exactly how many factors ought to work together for the successful operation of the shuttle. Someone has to design it, make it, and run. The machine itself comes with millions of parts put together into a meaningful system. There are people down there on the ground level to let the thing go up into the orbit and come back home safe. But the Challenger was aborted even before it got into the orbit. Now let us talk about life. I do not know exactly how many people are living on this planet earth (and in the outer space somewhere in some machine). Seven billion? Eight billion? How are all of them doing? Some do well some don't. But what about you? I wish you do well. But how? In the book of Jude 1:20-25, Jude one of Jesus' siblings shares how. But you, dear friends, by building yourselves up in your most holy faith and praying in the Holy Spirit,  keep yourselves in God’s love as you wait for the mercy of our Lord Jesus Christ to bring you to eternal life. To him who is able to keep you from stumbling and to present you before his glorious presence without fault and with great joy---  to the only God our Savior be glory, majesty, power and authority, through Jesus Christ our Lord, before all ages, now and forevermore! Amen. And the how comes with 12 factors working together. 1. Build - life ought to be built up, just like my cat Morgan needing to keep eating, grooming etc. 2. Yourself - it is your 'self' that ought to be built up. 4. Prayer - you need to communicate with God the Father from whom your life originated. 5. the Holy Spirit - if you believe in Jesus the Son, God gives you the Holy Spirit to be with you and help you do well. 6. Keep - it is your responsibility for you to keep the new life given you. Often times Morgan runs out of the side gate into the street (De Palma) to check what is going on out there. I hope she stays in my backyard, for one day Sammy (Morgan is the mother) became venturous, went out to the De Palma street only to be run over by a car. 7. Love - the only place (or environment) where your life is kept safe and secure is in His love. 8. Waiting - Jesus the Savior is going to come back again to give you a ressurected body. 9. Mercy - compassion, forebearancde toward an offender, discretionary power to grant relief. 10. Jesus Christ - He died for our sins and rose again for our justification. And he will come to bring his bride back home. 11. Eternal Life - the life in a resurrected body. 12. The glorious presence of the Father - the essence of the life eternal.